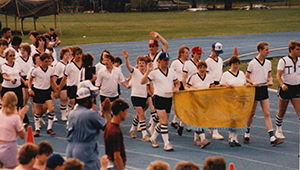 Athletes march in the Parade of Athletes at the first ever Special Olympics Games in Kentucky. On June 6, 1970, athletes marched across the track at Valley High School in what was the first Special Olympics Parade of Athletes opening the first Special Olympics Games ever held in Kentucky. We invite all current and former athletes, volunteers, coaches and families to return to Valley High School with us on Sunday, Aug. 19, to celebrate the 50th Anniversary of the global Special Olympics movement. The celebration will run from 1-4 pm at Valley High School in Louisville and will include a parade of athletes, Unified sports exhibitions and recognition of longtime athletes, volunteers and supporters. There will also be an unveiling of a permanent marker that will be placed at Valley High School to commemorate its role in the birth of Special Olympics in Kentucky. The Kentucky celebration follows the global 50th Anniversary celebration that took place in Chicago from July 17-21. “We’re excited to be able to give Special Olympics supporters in Kentucky who can’t make the trip to Chicago the opportunity to celebrate this incredible milestone together,” said Special Olympics Kentucky President and CEO Trish Mazzoni. “And we thought it was appropriate to go back to where our state program began to do that. We’re thankful to the people at Valley High School for helping make this possible. The Special Olympics Kentucky 50th Anniversary Celebration is sponsored by UPS, PNC Bank, Delta Dental, the Independent Pilots Association, iHeartMedia, WBKR and the VV Cooke Foundation. For more information about the 50th Anniversary Celebration or to find out how you can be involved, contact Jennifer McMahon at 502-695-8222 or jmcmahon@soky.org. How Long Have You Been Involved in Special Olympics? If you are attending, how many guests will be coming with you?